As colleagues we have been developing a base map to used for planning representing environmental regions of Kauai. Our goal is to respect the traditional Hawaiian system of Ahupuaa and bring a time-tested perspective to today’s effort of land management and governance. WHAT WERE KAUAI'S HISTORIC DISTRICTS? Today, convention lists five Moku regions of Kauai: Na Pali, Halelea, Koolau, Puna, and Kona. However, this was not always so. Maps from as far back as 1820 tell a different tale with as many as six Moku. Some maps from the later 1800’s and early 1900’s show as few as three. Evidently, there were either different understandings of what the districts were, and/or the districts changed with the political changes that have swept Hawaii. Perhaps when there was self-rule on Kauai, a greater understanding of our aina resulted in a greater diversity of regions, while external rulers, ‘consolidated’ for the purpose of ruling from afar. 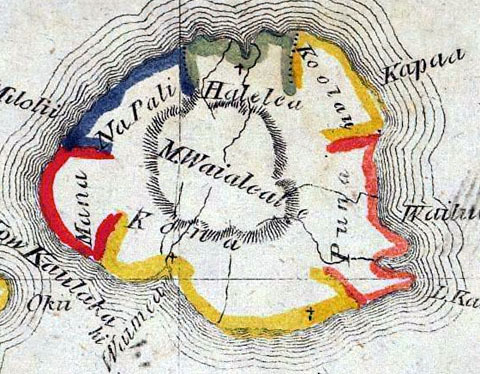 Also interesting is that the first map of Hawaii done by a Hawaiian, in 1837, shares a feature with several other early maps: the Moku districts do not extend “from makai to mauka” to meet at the center of the islands. They are mostly restricted to the coast. The central region of the island remains open and undelineated. In our last column we wrote about these mountainous interior regions as Kua, or God's country. Perhaps as in today's current forest conservation areas, this was considered a common area considered to be ‘out of bounds’. Although there are many differences with the details of Moku on Kauai, most maps consistently show four broadly descriptive district names: "Koolau" - which means "windward", "Puna" - which means "spring of water", “Kona” - means “leeward”, and Na Pali - that means “the cliffs”. By ‘broadly descriptive’ we mean that these region names are not exclusive to Kauai, but appear on more than one of the other Hawaiian Islands. Hawaiians quite simply “called 'em like they saw ’em” with the windward area of the island, being called: “Windward.” It is hard to argue with that. Today Kauai is chopped up into Tax Map Key districts by the logic of the marketplace. With the TMK the main intent is to identify who owns the land and how to collect revenue from it. From a Hawaiian or environmental view, this is rather upside down – everything begins with the land. For our map we started with the five Kauai Moku now widely accepted - Kona, Na Pali, Halelea, Koolau and Puna - and harmonize with the contemporary political and social realities. Because “Kona” is almost half of the island, and "Puna" has almost half the population, we feel that they would each be better managed and represented if divided into smaller districts, or Kalana. 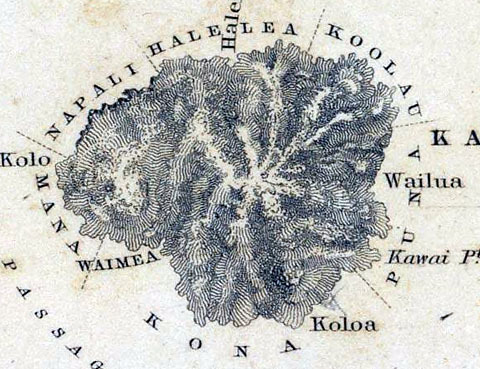 Although there are no historic maps that show a division of Puna into Kalana, there are maps that show Kona divided either from Mana or the Koloa southside area: Hence the Kalana of Mana, Waimea and Koloa. Looking to how the Hawaiians managed the land will be increasingly useful as we strive for a self-sufficient sustainable life on Kauai. 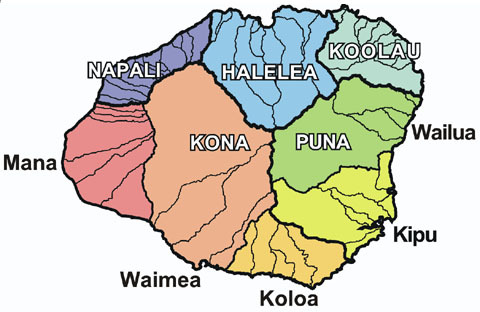 If the people of Kauai keep a seven person County Council to manage the island, these seven populated districts could be the basis of Council representation, with Na Pali as a commonwealth area, shared by all. Future governance may even be by an Ahupuaa Legislature representing the many individual watershed based communities of Kauai. We are not saying our suggestion is a "final answer" - it is an interpretation. Any new way of looking at Hawaiian tradition and county government will likely create turmoil. But look at them we must. Our hope is that a new and vital discussion begins, and that the aina be a part of it. We will be posting an evaluation map of Kauai environmental districts and more detail on the smaller Ahupuaa, as well as regional community centers on the website.